Hands up if you're also a Harry Potter nut? Yup, knew it. We all know I am! Last year my cousin and I finally got to use our Christmas presents from our Grandparents to go on the Harry Potter studio tour. We were both so excited rocking our matching Time Turners, taking selfies in the Mirror of Erised and crying at the end. 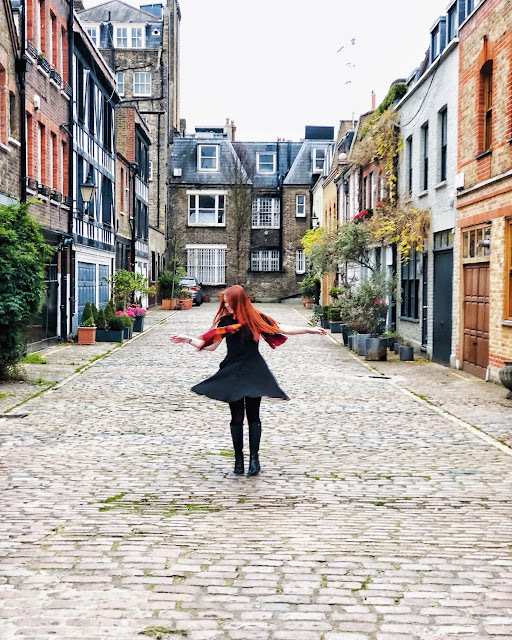 When my boyfriend offered to take me around Christ Church and see the actual locations and inspiration for a lot of the Hogwarts sets, I nearly exploded with joy. I don't think he has ever seen me that excited. Dude... that's Hogwarts. ACTUAL HOGWARTS! From the second we arrived in Oxford I was a squealing ball of glee (annoying right?) skipping down the streets to Christ Church. and when we arrived I wasn't sure if I wanted to cry, scream or just go quiet in sheer awe. I've been around Oxford a couple of times and I always love how beautiful it is but Christ Church is just outstanding. The first stop was OBVIOUSLY the Great Hall... it had to be done. When I went to the studio tour, I was allowed to open the doors to the Great Hall because it had just been my birthday and I remember the sheer exhilaration of being in there whether or not it was real. It didn't matter to me. When we got to the Hall in Christ Church, I was surprised to see how small it was in comparison but when you saw it you really saw Hogwarts. There are vaulted ceilings, portraits hanging from basically every inch (including ones of CS Lewis and Lewis Carrol! ), beautiful fireplaces and the rows of tables. The only thing missing were the house flags but the loser I am imagine the gold and crimson Gryffindor colours everywhere. We wandered around the church for a while which was equally as beautiful and I loved how someone was there just practising on the Organ. Then we went outside and through the cloisters. Unfortunately there was no Honeydukes, but we popped over to a 'retro' sweet shop opposite the university that sold a bunch of official Harry Potter sweets and Gary treated me to a sugar mouse and some Cola Cubes. Have you had any fun day trips recently? Freckles - Love them or hate them? Some of you may have already seen/heard that people have started to spend money on having their freckles permenantly removed. I had a quick discussion about this on Facebook and it's still really bothering me. Obviously it may not be as the Daily Mail claims, a new 'trend' or 'craze' but people are definitely having it done and I genuinely don't understand. The lady in said article says that she was self conscious about hers after being bullied which is understandable. Maybe I'm lucky in the sense that I was able to deal with being bullied over mine... and my glasses... and my height but I (personally) still don't think it's worth spending that much money to have some flecks removed. Plus, I don't think there should be a reason to no longer embrace who you are, but again, maybe I'm just lucky. Freckles are one of the things that make me 'Me', if you know what I mean? I've naver made any attempt to hide them and I actually quite like how more and more appear when I'm in the sunshine. One of the reasons I look forward to summer is because I get more!! My flatmate made the point of 'you wear foundation' but the only reason I wear it is because my skin is in a bad condition and I need to hide spots and pores. Luckily I have found a foundation that means my freckles are still proudly on show! During the summer, especially on holiday, the sun starts to clear my skin so I like to go bareface. One thing I don't understand about this procedure is how surely you'll still get them back after you've spent a good few days basking in the sun so surely it's a waste of over £100 per session? Plus, after the success of #NoMakeupSelfie, you'd think people would be more confident with themselves following all the compliments received despite flaws? Now we hear about people being offered laser treatments to get rid of something truly beautiful. Freckles add true character to your face and I know so many people who wished they had them. Freckles add to your own beauty and think about it, how dull would a leopard be without its spots? Treasure every single 'fairy kiss' you have and NEVER let people feel like you aren't beautiful because of them. They're probably just jealous. What do you think? 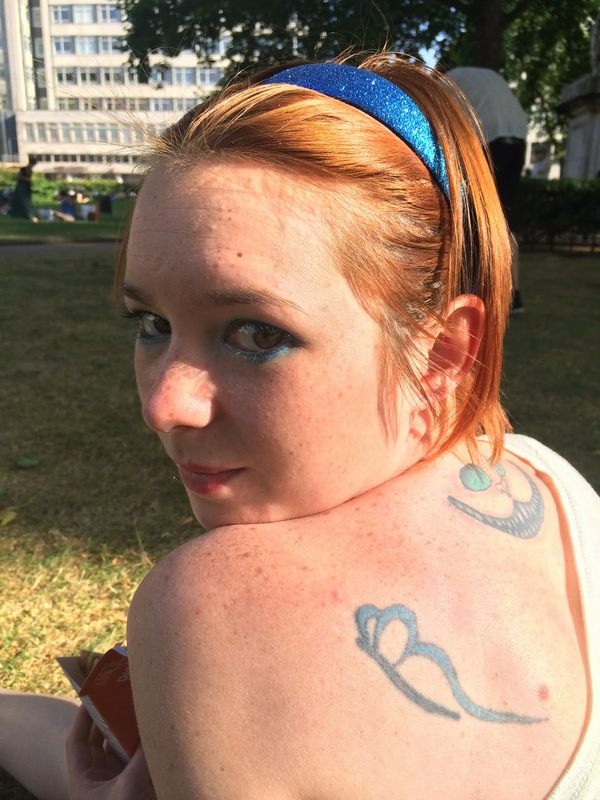 Do you love your freckles, hate them or whish you had them? It's reached that time of year again where I have run out of all of my favourite things and need to replace them quickly. There are things that you just can't compromise on afterall, it's those or nothing at all. So, I thought I'd show off some of my favourites from Lush with you that I can't live without and also some of the new stuff that may have accidentally slipped into my basket. Tricksters. This is one of my favourite things and is a real life saviour in the summer. Being Tea Tree and all that it does wonders for blemish prone skin like mine, which always seems to get worse when it's warm, and it feels amazing to spray a little on your face. Instant refreshment at the end of the day! Sunnyside is one of the Bubble Bars and it's absolutely COVERED in glitter. So being a magpie, I have to buy it everytime. I used to be in love with Ruby Red Slippers that used to come out every Christmas but they no longer make it so this became my subtitute but very quickly turned into a must have. The Comforter is another Bubble Bar that I normally save for days when I've struggled to sleep as it just makes me feel all cozy and it smells like Vimto. Does anyone else remember Never Too Busy to be Beautiful? It was Lush's sister shop and makeup brand before the recession hit. I was devastated when they closed down as it made some of my favourite things disappear off the face of the earth. Breath of God was one of their perfumes and now it's back at Lush and this makes me happy beyond words. Oh my God. So Lush now do sun lotion. This is awesome because other than a select few, many sun lotions are tested on animals which is completely not for me. At £25 for a sun lotion it's a little out of my price range as I'm bound to use all of it in a short space of time (I burn so easily) but I made sure I got a little tester to try out. As some of you may already know from my Instagram antics, I love cooking. Especially baking! I like to think I'm quite good for an amateur but there's so much more I need to learn and perfect before I can ever think of myself as a Monica or Bree Van de Camp - sadly I WILL be one of these two when I'm older and I really don't mind. When Anneleise invited me to attend the Underground Cookery School, I jumped at the chance. Who could say no? Annoyingly I missed the intro and canapes (silly tube) but when I arrived I was immediately greeted with what became a magical glass of Prosecco that was never empty. I also realised that I managed to miss the bit I was dreading, my flatmate shelling broad beans! We got to experience a lot of things for this from making meringue perfectly (I thought I was already awesome at it but was proven wrong) carving a chicken properly and filleting a sea bass. The latter were relative new to me, I don't like handling chicken on the bone and usually my flatmate does this part at home and because I'm scared of fish (don't judge me) I had never handled a fish that still has its face before. I usually get freaked out by them 'looking at me' when ever we go pass the fish counter in supermarkets! It was such a big deal for me, you have no idea. Carving the chicken properly actually went pretty well considering it's not one of my favourite things, I'm really short and have next to no body strength. I did have to do most of it while standing on my tiptoes! As you can tell by my face, I was not impressed with this situation! The sea bass was an entirely different matter. I ended up absolutely obliterating mine and the chef had to do an extra one :-p Oops. There was no point in me even taking a photo of this. It was shameful. Now I've tasted it, I don't understand what my issue was with eating fish. My flatmate has got me eating things like cod but venturing any further seems strange to me but when we had it as our starter, it was absolutely amazing so I'm honestly considering making it at home... will have to buy fillets though! All sat down and tucking into our starter. The main course was with broad Beans, Jersey Royals and Salsa Verde. Normally I wouldn't even be able to handle beans being on my plate as they could contaminate the rest of the food but I was a big brave girl and the first thing I did was put all the beans on my flatmate's plate. Once that situation had been dealt with, I dove right in and I'm pretty sure this was my favourite dish on the menu! And then came dessert of Strawberry Meringue Roulade. I am funny with sweet things. I love making them but very rarely eat them. I have no idea why. This was a completely different matter, considering we did every single step (excluding putting them in the oven) I had to give it a go because it would be rude not to. I ended up polishing the whole thing off a la Simpsons style when all the food is gone in a few seconds. Charlie getting ready to finish off the dessert! At the end of the evening I went home with a very full belly and totally ready for a sleepy. I met some wonderful bloggers and had a whale of a time. If you get a chance to go to the Underground Cookery School, you can book a place over on their website http://undergroundcookeryschool.com/ and if you fancy any of the featured recipes, just give me a shout and I'll send them your way! 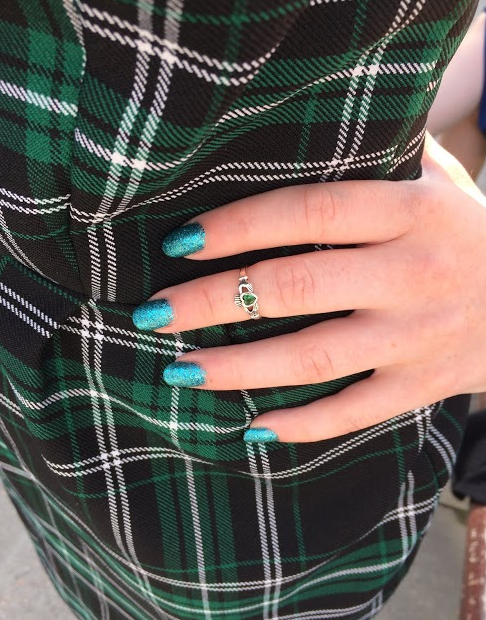 I don't know about you but I fricking love Tartan. Being half Scottish it's a part of my culture and we have our own colours. They are absolutely beautiful and my dad says he will only buy one kilt in his life and that will be worn to my wedding. Isn't he sweet. An another sweet note my boyfriend bought me this Tartan dress completely out of the blue and I love it. It's one of my go to work dresses as it's nice and sensible and still screams 'me'. 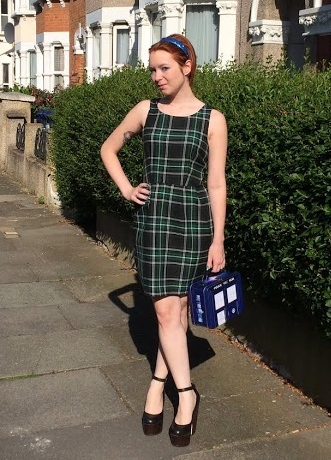 Today I chose to wear it with my new platform shoes from the office sale which add a good few inches, making me look a normal person height, and some blue accessories including a TARDIS lunchbox as a bag. I'm cool. I went for blue accessories because I have recently tried a new Barry M nail polish and wanted to make it a part of my outfit. It's an absolutely beautiful shade but the only downside is that it took 4 coats to get a good amount of coverage. It's going to be such a pain to take off but it still looks pretty. How do you wear Tartan?